A community conversation about the importance of coalitions in building democracy, fostering social justice, and improving Baltimore’s future. 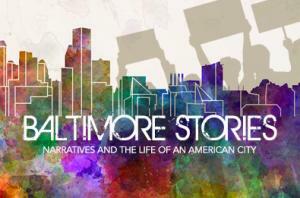 The 4th Baltimore Stories Art of Transformation event: Morrell Park: A Community Conversation Event. Baltimore Stories: Narrative 4 engages a group of Baltimore high school students and Baltimore first responders in a structured story exchange as a way to break down barriers and increase empathy. 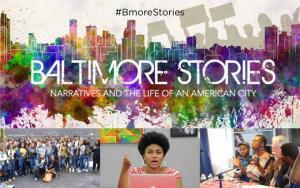 Highlights from the Baltimore Stories project. The initiative was a year long project of 20 events used to promote empathy through the sharing of stories and narratives. "One photograph shows a National Guardsman in fatigues outside Harborplace. Another captures a large crowd gathered outside Penn Station. A third shows young boys riding bicycles past marchers carrying signs that read "Justice 4 Freddie Carlos Gray." "The more than 12,000 images — some taken by seasoned photographers, others by ordinary people with cellphones —form one part of "Baltimore Stories: Narratives and the Life of an American City." "The yearlong project, funded by the National Endowment for the Humanities, aimed to "contextualize narratives of race," organizers said. The Dresher Center for the Humanities in the University of Maryland, Baltimore County's College of Arts, Humanities, and Social Sciences hosted the event, and the project was a collaboration among the University of Maryland's College of Arts and Humanities, Maryland Humanities, and others." Read the complete article at The Baltimore Sun. This daylong event will offer the opportunity for reflection on the programming of the past year and consider its impact on the understanding of Baltimore's future narratives. What is the Baltimore you imagine?